Arterial aneurysms represent a significant cause of morbidity and mortality worldwide; therefore, there is a growing need for the rapid and precise tool or method enabling to predict aneurysm emergence. The objective of this study was to develop a computer-aided method for aneurism prediction. Here we utilized a computer-based approach to establish a non-invasive, high-resolution and rapid method for the prediction of aneurysm-prone arterial segments based on combining microcomputed tomography (microCT) scanning with finite element analysis (FEA). 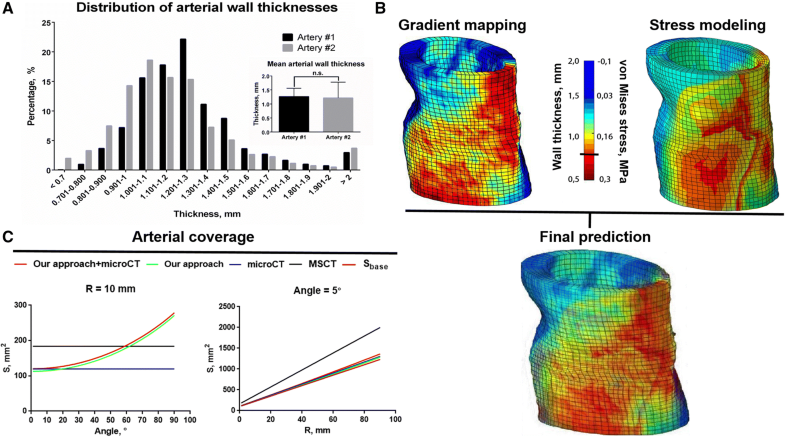 We performed a microCT image binarization and designed a computing algorithm for FEA mesh construction, followed by application of gradient mapping and stress modeling to identify thin-walled high-stress areas responsible for the development of aneurysms. The fidelity of our computing algorithm for FEA mesh construction was similar to the commercially available software. The maximum possible error of our approach did not exceed that of either microCT or clinically available multislice computed tomography angiography scanning. Our computational approach revealed thin-walled arterial segments under a high stress, therefore potentially predicting aneurysm-prone sites. Here we demonstrate our approach for the prediction of arterial segments under a high risk of aneurysm occurrence, which should be further validated in pre-clinical models to be translated into the clinical practice. The online version of this article ( https://doi.org/10.1007/s40846-018-0422-x) contains supplementary material, which is available to authorized users. An arterial aneurysm is defined as a focal dilation of an arterial wall [1, 2]. The two most common types of arterial aneurysms are intracranial and aortic aneurysms . Intracranial aneurysms occur in or near the circle of Willis, an interconnected system of arteries that supply blood to the brain and surrounding structures; aortic aneurysms occur in the aorta, the main artery in the human body, originating from the left ventricle of the heart and extending down to the abdomen . Being initially asymptomatic, aneurysms can rupture, causing a major clinical event. At least one in 20–30 adults carries an asymptomatic intracranial aneurysm, approximately a quarter of which ruptures during the lifetime . The global death rate from aortic aneurysms tends to increase, reaching almost 3 per 100,000 population in 2010 . Thus, there is currently a need for a screening method to define arterial segments at a high risk of aneurysm development. In terms of biomechanics, the predictive algorithm could be similar for both types of arterial aneurysms ; however, a computational approach for the prediction of aneurysm-prone sites in the arterial wall is still an unmet clinical need. The computational modeling of arterial geometry can be considerably complicated by asymptomatic atherosclerotic lesions [5, 6]. Internal mammary artery (IMA) undergoes atherosclerosis extremely rarely [7, 8], thus being the only blood vessel suitable for the development and verification of such approach. Here we suggest to use a microcomputed tomography-aided (microCT) imaging of IMA as a template for developing a computer-based model for aneurysm prediction . 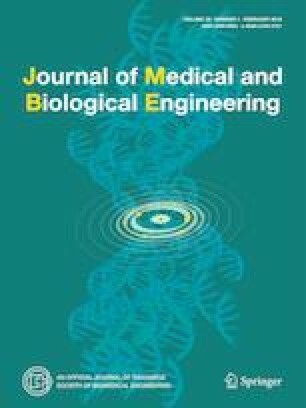 In this study, we used bovine IMA, since its biomechanical properties are virtually identical to human IMA, therefore being utilized for arterial replacement in clinical practice [10, 11]. For the computational modeling of stress we performed a finite element analysis (FEA), a computerized method subdividing an entire object, e.g. arterial wall, into smaller parts called finite elements [12, 13]. The simple equations which model finite elements are then assembled into a larger system of equations that models the arterial wall [12, 13]. Using this approach, we developed a microCT- and FEA-based model for the prediction of arterial segments prone to the development of aneurysms. We performed microCT scanning of two bovine IMA using TOLMI-150-10, an original microCT scanner designed in National Research Tomsk Polytechnic University . For microCT, we used the following parameters: X-ray tube voltage of 100 kV, X-ray tube current of 5 mA, exposure time of 1 s per frame, angle step of 0.35°, and voxel size of 67.3 µm. Images were imported to MATLAB R2015 (MathWorks) following the reduction of a graylevel image to a binary image by Otsu’s method  as shown in Fig. 1a. This algorithm assumes that the image contains two classes of pixels (foreground pixels and background pixels) and then calculates the optimum threshold separating these two classes so that their intra-class variance is minimal while their inter-class variance is maximal . To address potential issues caused by noise, all input images were low pass filtered using the ImageJ software (National Institutes of Health, Bethesda). Since we found that a conventional approach for FEA mesh generation requires excessive time to complete further stress modeling, we developed a new approach. We first determined the boundaries of IMA in all microCT images using Moore neighborhood . This algorithm worked as shown in Fig. 1b: the selected pixel was bypassed from the bottom up and from left to right on eight neighboring pixels until entering the start pixel for the second time in the same direction it was originally entered . where floor is an integer division rounded down. Arterial wall thickness was measured by a search of the intersections between the rays and arterial boundaries following the subtraction of the distance between the center of mass and inner boundary from the distance between the center of mass and outer boundary (Fig. 1c). The number of thickness measurements was equal to the number of rays (N) multiplied by the number of images. The number of FEA mesh layers was equal to the ratio of the mean arterial wall thickness to the mean distance between the intersections of the rays with the inner arterial boundary (Fig. 1c). To complete the construction of FEA mesh nodes, we divided each ray segment between the inner and outer boundary into segments of the same length, number of which was equal to the number of layers (Fig. 1c). 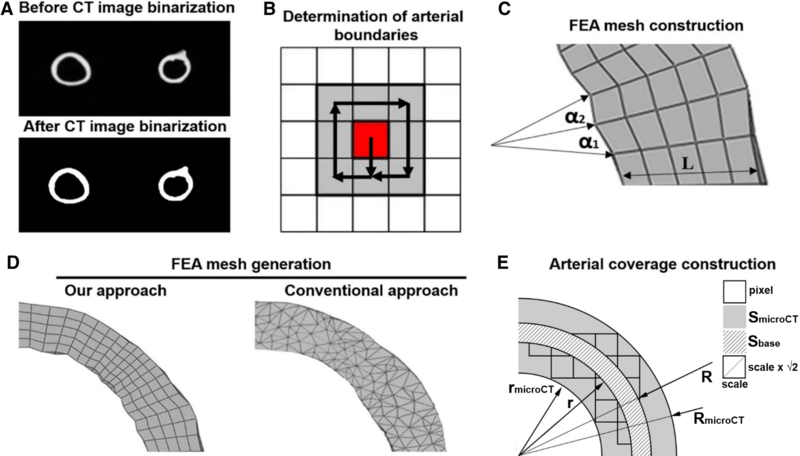 For the generation of the FEA mesh, we selected the number of images equal to the ratio of arterial length to the mean distance between the intersections of the rays with the inner arterial boundary. We then compared our original approach for FEA mesh generation to the conventional approach (Amira Software, Zuse Institute Berlin), with a coverage difference of only 3.9% (Fig. 1d). The distribution of arterial wall thicknesses was considered as normal according to the Chi square test. Therefore, we calculated minimum and maximum values, mean, and standard deviation. With the aim to better visualize the results, we performed gradient mapping. Each node of the FEA mesh was defined as a certain thickness, and values in the voxels between the nodes depended on values in the nodes. The distribution of thicknesses was represented by a spectrum of colors. As a consensus approach to define which of the areas are considered as thin-walled, we stratified the whole sample of measured thicknesses into the sextiles, with “thin” segments defined as those within a lower sextile (≤ 0.74 mm). Convergence analysis was performed to identify the optimal length of the edge of the finite element mesh, whilst maintaining a sufficient level of accuracy of calculations. To do this, the model of a 10 mm test vessel was divided into finite elements with the following side lengths: 0.14 (number of finite elements = 130680); 0.22 (48000); 0.27 (21120); 0.34 (12960); 0.40 (7920); 0.44 (3744); 0.48 (3300); 0.54 (2640); and 0.64 (1440) mm. The finite elements were 20-node quadratic isoparametric elements C3D20. During the analysis, we assessed the maximum and minimum principal stresses of the vascular wall in response to the application of the internal pressure of 140 mmHG on the inner surface of the wall. We found that the stabilization of the solution results occured upon the grid dimension starting from 12960 elements, i.e., with the length of the side of the final element being 0.34 mm, which was used in further experiments (Supplementary Fig. 1). FEA mesh was imported to the Abaqus/CAE (Dassault Systèmes), a software suite for FEA and computer-aided engineering. To define the biomechanical properties of bovine IMA, we examined ten arterial samples in the circumferential direction using a universal testing machine (Zwick/Roell) according to manufacturer’s instructions. Briefly, a sample of 5 mm in length was cut from each vessel and subsequently fixed in custom made clamps specifically designed for this purpose (Supplementary Fig. 2). The specimens were stretched at a traverse speed of 50 mm/min and a 50 N force sensor with an error tolerance of ± 1%. The stress–strain curves generated as a result of physical–mechanical testing were approximated using the second-degree equation on the basis of the least-squares method to obtain a generalized curve characterizing the biomechanical properties of vessel wall (Supplementary Fig. 3). The resulting polynomial was then imported into Abaqus/CAE software as a “nominal stress-nominal strain” table, on the basis of which, using the built-in tools, an optimal description of the material was selected (Table 1). The candidates for material model were the following: Polynomial model II order, Ogden N = 3, and Reduced Polynomial N = 1(Neo Hooke). As a result, it was shown that the Polynomial model II order candidate demonstrated stability in the entire range of deformations and the best correspondence to the test data plot (Supplementary Fig. 4). With the aim to identify high stress areas in the arterial wall, we performed a computational modeling using the Abaqus/Standard solver to reveal how IMA reacts to high systolic pressure of 140 mmHg applied to the inner surface of the vessel. The ends of the vessel model were fixed from displacement along the longitudinal axis (Z) and from rotation relative to the central longitudinal axis (R) relative to the cylindrical coordinate system. Based on the results of convergence analysis, for the modeling we used the C3D20, general-purpose 3D 20-node quadratic isoparametric elements (3 × 3 × 3 integration points), and von Mises stress, a measure widely applicable for the analysis of plastic deformation of ductile materials. Similar to the definition of thin-walled areas, we divided the whole sample of measured von Mises stress values into the sextiles, with the segments experiencing the highest sextile (≥ 0.244 MPa) defined as at a high stress. Hence, all squares intersecting the circle were inside the annulus with radii (2) and (3) (Fig. 1e). The scale was 0.06731 mm/pixel and 0.4 mm/pixel for microCT and MSCTA, respectively. was a minimum coverage of annulus Sbasic by our approach. We first obtained 1528 images per each of the two bovine IMA using microCT scanning following image binarization and FEA mesh generation. Thicknesses of distinct segments within the arterial wall varied from < 0.7 mm to > 2 mm, as demonstrated in Fig. 2a. The distribution of arterial wall thicknesses was considered as normal, and mean thickness of the two arteries did not differ significantly (Fig. 2a). We then questioned whether arterial wall contains high stress areas and whether they correspond to the regions of low thickness. Having performed the examination of bovine IMA in the circumferential direction using a universal testing machine, we identified specific biomechanical properties and further calculated coefficients for the FEA-based stress modeling (Supplementary Fig. 4 and Table 1). This computational approach revealed areas of high stress in the arterial wall, which were occasionally co-localized with thin-walled areas (Fig. 2b). However, a major proportion of high stress areas did not correspond to the thin areas, and vice versa (Fig. 2b). it did not exceed the error of both microCT and clinically available MSCTA scanning until the angle was < 7° or with an angle of 5° regardless of the radius (Fig. 2c). Cardiovascular diseases (CVD) are the predominant cause of death globally. One of the most dangerous CVDs is aortic aneurism, pathologically resulting from trauma, infection or intrinsic abnormality in the elastin and collagen components of the aortic wall. Genetic factors are also playing a role in etiology of aortic aneurisms, with multiple genetic syndromes, such as Marfan, Ehlers–Danlos and others, being associated with their occurrence. While dormant arterial aneurysms can be asymptomatic, their ruptures cause significant morbidity and mortality [18, 19, 20, 21]. Screening is considered as an important tool for reducing risk of ruptures, halving the risk of dying from aneurysms [18, 20]. Combined screening for intracranial and aortic aneurysms is cost-effective due to their high coprevalence . Despite some promising results demonstrated by the currently available screening techniques, i.e. ultrasonography, CT angiography, and magnetic resonance angiography [18, 20, 23], the search for low-cost, non-invasive, and high-resolution screening methods is still ongoing to further improve efficiency and ultimately reduce the risk of ruptures. In this study we suggest that a widespread diagnostic tool CT can be combined with FEA, gradient mapping, and stress modeling to provide an approach holding all the above-mentioned advantages for a screening of arterial aneurysms. Furthermore, this approach can potentially have an additional edge enabling prediction of arterial segments prone to aneurysm development. Here we presented our microCT and FEA-based approach for the prediction of aneurysm-prone arterial segments that included microCT image binarization, FEA mesh construction according to the original algorithm, gradient mapping, and stress modeling. Utilizing this method, we identified that a major proportion of high stress areas did not correspond to the thin areas, and vice versa. We therefore speculated that arterial wall thickness or value of von Mises stress independently are unlikely to be responsible for the predisposition of an arterial segment to aneurysm development; however, both of these parameters determine high-risk sites when combined. Indeed, it is well recognized that thin areas at high stress in the arterial wall are responsible for the development of aneurysms [24, 25, 26]. Importantly, we identified these aneurysm-prone arterial segments with a relatively high frequency. It could be argued that mechanical properties of arterial wall vary between different samples. However, in our study the actual stress values did not reach the critical point and generally corresponded to 3–5 mm displacement where the results of a tension test were uniform. In addition, the resolution of ultrasonography as well as computed or magnetic resonance tomography angiography were currently quite low (> 625 µm) whilst the calculation of force–displacement curve is highly operator-dependent all resulting in actual error exceeding that of our computational approach. Because the proposed algorithm demonstrated correct performance and promising results, we speculate that it is not limited to IMA and can be utilized for other arteries. To sum up, the advantages of our approach are: (1) noninvasiveness; (2) it significantly accelerates stress modeling compared to the conventional algorithm for FEA mesh construction, with a coverage difference of < 4%; (3) its maximum possible error does not exceed the error of either microCT or MSCTA scanning. Our approach, nonetheless, has limitations. The research presented here is purely a biomechanical study with the aim to develop a computational model for identification of high-stress areas in aorta, potentially predicting the formation of aneurysms. For assessment of its clinical relevance, more follow-up work is required to test its feasibility and validity. The next step would be to examine the performance our numerical model in genetically predisposed or chemically induced experimental models of abdominal aortic aneurysms. Alternatively, our approach could be tested in arteries in hydrodynamic bench or pulsating flow setup equipped with micro-ultrasound device. Thus, it is important to note that our model requires validation in pre-clinical models to be considered for use in clinical practice. Taking together, our approach enables detection of arterial sites predisposed to aneurysm development. Further research should focus on developing a model of arterial wall degeneration to predict not only the areas but also the conditions of aneurysm development. This study was supported by the Complex Program of Basic Research under the Siberian Branch of the Russian Academy of Sciences within the Basic Research Topic of Research Institute for Complex Issues of Cardiovascular Diseases No 0546-2015-0011 “Pathogenetic basis for the development of cardiovascular implants from biocompatible materials using patient-oriented approach, mathematical modeling, tissue engineering, and genomic predictors”. The Ethical Committee of the Research Institute for Complex Issues of Cardiovascular Diseases approved the study protocol.